This is the thread to let us know who you are, and to find out who we are. Put not just who you are and what you play, but any other interests or information you don't mind the whole world seeing. As we find more things that several of you like we can add to the forum to accommodate such needs. I am DecoyFlyer, just a decoy really. I started this forum after a discussion with a few adult friends, who like myself, enjoyed playing Disney's VMK (Virtual Magic Kingdom), but wanted a forum to discuss it without the childish BS that seemed to ooze from other such forums. VMK is gone now, but we have chosen to continue the forum, as we have truly become a family. I hope you all continue to enjoy what we have here, and that the family will continue to grow, as we pursue and discuss other common interests. I will try to update later as I add, or remember, others. papaduck here.......I was geezerduck in VMK, didn't get on much, but made many wonderful friends there and here. mamabunny, we have been married 41 plus wonderful years. Hot Rodding, my toy is a 1964 Dodge Polara with a 440 for power. Drag racing, old style for fun and good times, building a 1950s style rail at the present time. by choice a pilot and owner of a 1946 Aeronca Champ. Motorcycles, been riding for 44 years now. Good food and occasionally good drink in moderation. Music, blues, older rock (50s, 60s, 70s), country, Irish. Cheese.......I know, it's food but I Love Cheese. Getting away from the city and out in the woods both by vehicle (4X4) and foot. Good Firearms, yes, I have a slight redneck streak in me. Currently not involved, but exploring options. HEY!! Who stole the "gas5" smiley? I'm KingQuackATac and you are my Minions (just kidding - still trying to get over VMK minion ownership thing). I enjoy talking to all of you on this board. I like the honesty, openess, and no BS! I have a wife of 12 (almost 13) years and she's over here as PrincessWendyBird. We have two children, 11 year-old son, and 7-year old daughter. We all enjoyed VMK together and are hopeful about VFK in that respect. We home school and try to spend much time together. I work for a family-owned appliance store in Cincinnati and have so for 7 years. Before that I was with Best Buy (LOL) for 6 years. If ya'll ever have any questions about an appliance (i.e. advice on buying one, or how best to use a certain feature, or service advice), just PM me. I'm blessed (or cursed) with an extensive knowledge about appliances from the low-end to the high-end. hmm.. let's see. I'm finally going to college after taking a year off! I used to be in choirs for most of my life, but surprisingly I'm going to school for Public Relations. oh and I worked for Walmart all of 6 months before they let me go for missing too many days (I had pnuemonia how could work while being sick?). I came over to this board because Days sent me the link to it. It is the most wonderful thing in the world to be a mom. Hi there, this is my first post here and I'm happy to have another place to stay in touch with my VMK friends. I've been married 12 years and I'm a SAHM (Stay-At-Home-Mom). My daughter (Angelicasparkle) plays many of the same games that I do. Originally with VMK I signed up my daughter and I tried it out first to see if it was something I thought she would be able to play. Well in the process of all of that, I met friends and found out it was so much fun. I had no idea there were that many adults playing. Anyhow now I play several games with my daughter. Candlelady here also known as Olivia I really am a candlelady, I sell Gold Canyon Candles because I love them, definately not for the money. I live in Arizona, I will be married 14 years in August we have 2 boys 10 (jaketheninja in VMK) and 3. We are Disney lovers, we have annual passes and go every other month or so. My parents live in california so we visit alot and of course have to go to Disney. We love to camp, "roughing it" in our RV I don't get too watch much tv except mickey mouse clubhouse, scooby doo and little einsteins. Thank goodness for DVR!! Welcome to all our new members. Filamentthebright herem, otherwise known as Bright, Gnome.he or many other titles which we shan't discuss at the moment. One of the resident Gnome.is that resides around here. Hi everyone. My name is Kathy but most shorten it to Kat here. Some folks here will tell you I'm mean, but that's just because I bite them once in a while. I'm usually on my good behavior. I really am alot like Dory, so if I forget something you've told me, just remember I have no short term memory. It runs in my family--or at least I think it does--Oh and yes I speak whale. Thanks Add for the invitation to this forum. I was Smackeralchick on VMK, although everyone called me Dis.Enchanted's "Sister" . I have 13 year old twin daughters, the VMK'ers formerly known as Dlandchick and Sesamestreetboy. We haven't gotten our titles on VFK yet, and are hoping to play more often now that there is no homework. Oh, duh, I just realized I haven't introduced myself here yet officially! Well, my name is Heather, but most folks know me as PrincessWendyBird. 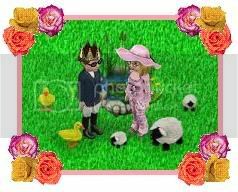 I have been happily married to KingQuackATac for almost 13 years. We have a son, 11, and a daughter, 7. Our son is our little miracle, as he was born at 30 weeks and he and I almost did not survive his emergency delivery. I am a stay at home mom and love it. We homeschool, so we are very blessed to spend lots of time together as a family. We really cherish those moments. Many of you may not know, I am in a wheelchair and have been ill since my daughter was born. My body had a reaction to the anesthetics and sort of went into "surgery shock". Some really miraculous things have happened recently and I am beginning to walk more and am looking forward to what lies ahead. Anything Disney-especially WDW!!! I don't get there enough. I love creative activities -scrapbooking or various art projects, I just need more hours in the day! "The sun never sets on those who ride into it." I am Patchy, also called Alyssa.... I am a college student in the gist of transferring. I am majoring in biology with more of a concentration in Marine Biology...I am just pretty much trying to get through life. TY Decoy! I love to know more about our no.bs friends! We have three dogs. We own a smart car and a yaris toyota. Live in Barrie Ontario Canada. About 75 miles north of Toronto. Did anyone notice how ugly are birds are in VFK rofl. Other than Disney there is other things than Disney. Learning new things like making videos and other applications on computer. I started VMK shortly after it opened and was on until the very last day. DH had a character there also, sorcerertd, although I'm the one who mostly played him. I now spend most of my time at Gaia, which I love, and where once again DH also has an account (he likes the games). I don't spend alot of time of VFK yet but may as they continue to improve and add new things. I am keeping an eye on Elf Island also.